In 2009, Bethel opted out of status as a " Local Option" community, theoretically opening the door to allowing alcohol sales in the city; residents and city officials maintained that all liquor license requests would be actively opposed. In October 2015, though, a vote for allowing alcohol sales in Bethel passed and two liquor licenses were approved for existing stores in the city. Though the region is flat and generally treeless, Bethel lies inside the Yukon Delta National Wildlife Refuge, the second largest wildlife refuge in the United States. Bethel has a subarctic climate ( Köppen Dfc), with long, somewhat snowy, and moderately cold winters, and short, mild summers. Monthly daily average temperatures range from 6.6 °F (−14.1 °C) in January to 56.0 °F (13.3 °C) in July, with an annual mean of 29.9 °F (−1.2 °C). Warm days of above 70 °F (21 °C) can be expected on 13 days per summer. Precipitation is both most frequent and greatest during the summer months, averaging 16.2 inches (411 mm) per year. Snowfall usually falls in light bouts, and is actually greater in November and December (before the sea freezes) than in January and February, averaging 45 inches (114 cm) a season. Extreme temperatures have ranged from −48 °F (−44 °C) to 90 °F (32 °C). The first settlement at the location of Bethel reported on the 1880 U.S. Census as "Mumtrekhlagamute Station." It had 29 Inuit. 1/2 mile away was the adjacent Mumtrekhlagamute Village (1880 population: 41 (all Inuit); 1890 population (as Mumtrekhlagamiut) was 33 (28 Inuit and 5 Whites). Bethel was established at Mumtrekhlagamute Station in 1885 and supplanted it by the 1890 U.S. Census. It reported 20 residents (13 Natives and 7 Whites). Mumtrekhlagamiut would later be absorbed into Bethel. Bethel did not appear on the 1900 Census, but has on every census since 1910. It would formally incorporate as a city in 1957. As of the census of 2000,  there were 5,471 people, 1,741 households, and 1,190 families residing in the city. The population density was 125.0 people per square mile (48.3/km²). There were 1,990 housing units at an average density of 45.5 per square mile (17.6/km²). The racial makeup of the city was 26.83% White, 0.93% Black or African American, 61.78% Native American, 2.87% Asian, 0.16% Pacific Islander, 0.51% from other races, and 6.91% from two or more races. Hispanics or Latinos of any race were 1.70% of the population. There were 1,741 households out of which 44.1% had children under the age of 18 living with them, 42.6% were married couples living together, 15.2% had a female householder with no husband present, and 33.7% were non-families. 24.5% of all households were made up of individuals and 3.2% had someone living alone who was 65 years of age or older. The average household size was 3.00 and the average family size was 3.65. The age distribution was 35.5% under 18, 9.0% from 18 to 24, 32.7% from 25 to 44, 18.9% from 45 to 64, and 3.9% who were 65 or older. The median age was 29 years. For every 100 females, there were 110.4 males. For every 100 females age 18 and over, there were 109.6 males. The median income for a household in the city was $57,321, and the median income for a family was $62,431. Males had a median income of $45,321 versus $39,010 for females. The per capita income for the city is $20,267. About 10.6% of the families and 11.2% of the population were below the poverty line, including 9.7% of those under the age of 18 and 18.3% of those ages 64 and over. The state-owned Bethel Airport is the regional transportation hub, and is served by four passenger carriers, including Alaska Airlines, Ravn Alaska, Grant Aviation, and Renfro's Alaskan Adventure. It also receives service from three major cargo operators: Everts Air Cargo, Northern Air Cargo, Lynden Air Cargo, and numerous small air taxi services. The airport ranks third in the state for total number of flights. It offers a 6,400 foot asphalt runway, a 4,000 foot asphalt runway, and 1,850 foot gravel crosswind runway, and is currently undergoing a $7 million renovation and expansion. Three float plane bases are nearby: Hangar Lake, H Marker Lake, and the Kuskokwim River. 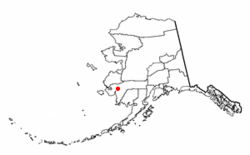 The Port of Bethel is the northernmost medium-draft port in the United States. River travel is the primary means of local transportation in the summer. A Bethel-based barge service provides goods to Kuskokwim villages. Within Bethel there are approximately 16 miles (26 km) of roads which are not connected to any contiguous highway system. Winter ice roads lead to several local villages, but their condition varies depending on temperature and snow fall. An extensive network of snow machine trails connects Bethel to villages all over the Delta, from the Bering Sea to the Yukon. Local recreational activities include snow machining, skiing, bicycling, kayaking, caribou hunting, and salmon fishing. Bethel is an established starting point to Float Alaska wilderness rivers in the Kisaralik, Kwethluk, Aniak, Kanektok, Arolik, Goodnews, Eek and Holitna River systems. The Yupiit Piciryarait Cultural Center also hosts a bimonthly "Saturday Market" where artisans and crafters from the Yukon Kuskokwim Delta come to sell their crafts. There is a variety at the market, but many of the crafts include traditional Yup'ik qaspeq, story knives, woven baskets, ulu knives and more. Bethel has a public television station, KYUK-LD, and three radio stations, public KYUK, private, non-profit KYKD, and commercial KEDI. Since the founding of its community radio station in 1970, the media has become part of Yup'ik development in southwest Alaska and important to the people's self-definition. The city is also home to the weekly regional newspapers Delta Discovery and Tundra Drums. Bethel has one official sister city. ^ 1996 Alaska Municipal Officials Directory. Juneau: Alaska Municipal League/ Alaska Department of Community and Regional Affairs. January 1996. p. 32. ^ 2015 Alaska Municipal Officials Directory. Juneau: Alaska Municipal League. 2015. p. 37. ^ City of Bethel. (2006-10-27). "Bethel City Council Member List." Retrieved on 2007-04-13. ^ Community Information Summaries: Bethel. Archived 2007-04-02 at the Wayback Machine Alaska Community Database Online, Alaska Department of Commerce, Community, and Economic Development. Retrieved on 2007-04-13. ^ a b "Geographic Identifiers: 2010 Demographic Profile Data (G001): Bethel city, Alaska". U.S. Census Bureau, American Factfinder. Retrieved September 18, 2013. ^ Orth, Donald. Dictionary of Alaska Placenames. Page 128. ^ "Radio". Bethel, Alaska: Bethel Broadcasting. 2010-02-26. Archived from the original on 2010-02-20. Retrieved 2010-05-19. ^ Avila, Jim; Holding, Reynolds; Whitcraft, Teri; Tribolet, Beth. " School Shooter: 'I Didn't Realize' They Would Die". ABC News. June 11, 2008. Retrieved February 28, 2014. ^ "Election Results". City of Bethel. 2009-10-06. Retrieved 2009-10-07. ^ Demer, Lisa (3 November 2015). "Video: Kilbuck school building burns in Bethel". Alaska Dispatch News. Retrieved 3 November 2015. ^ "Fire tears through Bethel school building". Alaska Dispatch News. 3 November 2015. Retrieved 3 November 2015. ^ "Fire engulfs Bethel school". Alaska Public Radio Network. 3 November 2015. Retrieved 3 November 2015. ^ a b "Climatology of the United States No. 20 1971−2000: BETHEL AP, AK" (PDF). National Oceanic and Atmospheric Administration. 2004. Archived from the original (PDF) on 2014-08-23. Retrieved 2011-01-18. ^ "Average Weather for Bethel, AK − Temperature and Precipitation". Weather.com. Archived from the original on 2011-01-05. Retrieved 2010-08-27. ^ Tizon, Tomas Alex (2007-11-30). "America's Taxi Capital: Bethel, Alaska". Los Angeles Times. Retrieved 2007-11-30. ^ "Yukon Kuskokwim Correctional Center". Alaska Department of Corrections. 2015. Retrieved 2015-11-18. ^ Bettine, Frank (September 2002). "SWGR Transmission" (PDF). University of Alaska. Archived from the original (PDF) on October 29, 2008. Retrieved November 7, 2011. ^ " Gladys Jung Elementary School." Gladys Jung Elementary School. Retrieved on July 13, 2018. ^ " Welcome to M.E. School!" Mekelnguut Elitnauriviat School. Retrieved on July 13, 2018. ^ " Ayaprun Elitnaurvik." Ayaprun Elitnaurvik. Retrieved on July 13, 2018. ^ "Kuskokwim 300". Retrieved 2007-11-30. ^ Bethel Council on the Arts (2011). "Cama=i Dance Festival". Bethel, Alaska. Retrieved 2011-11-07. ^ "Yukon-Kuskokwim Health Corporation - Medical Facilities". Retrieved 28 October 2014. ^ "Yukon-Kuskokwim Health Corporation - Service Area Map" (PDF). Retrieved 28 October 2014. ^ "Wayback Machine" (PDF). 12 August 2011. Archived from the original (PDF) on 12 August 2011. Retrieved 3 April 2018. Wikimedia Commons has media related to Bethel, Alaska.